Rose red(5 pt. 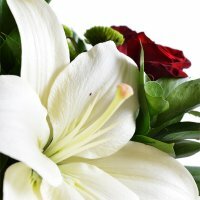 ), Lily white(1 pt. ), Сhrysanthemum green(1 pt. 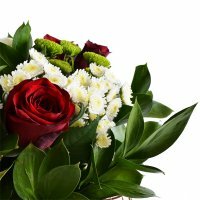 ), Сhrysanthemum white(2 pt. ), Greens(1 pt. ), Packing(1 pt. ), Tape(1 pt.). 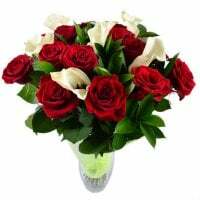 Birthday, Business, Colleague, For children, For grandmother, For her, For young lady, Gratitude, I Miss You, New-born, Teacher, Wedding flowers, Аnniversary. The motto of this composition, created in a classical style, is beauty and elegance. The effective combination of red, white and green colours is very popular in business bouquets and in exclusive flower gifts for special occasions. 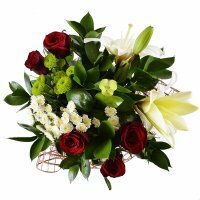 Red roses are teamed with amazing white lilies and blooming green chrysanthemums. The decor of the net matching the rose petals and greenery adds elegance and loftiness to the style. A perfect gift for the female leaders and business women. 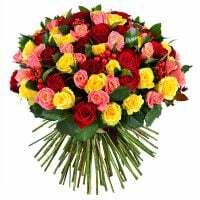 You can also order this bouquet for your mom, grandma, teacher for March 8 and any anniversary. 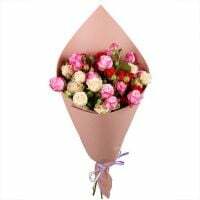 Flowers are beautiful and at the same time rather strict, they look very presentable and expensive. 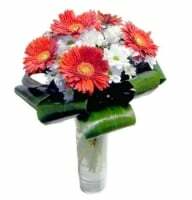 The bouquet composition can differ from the image presented on the site. 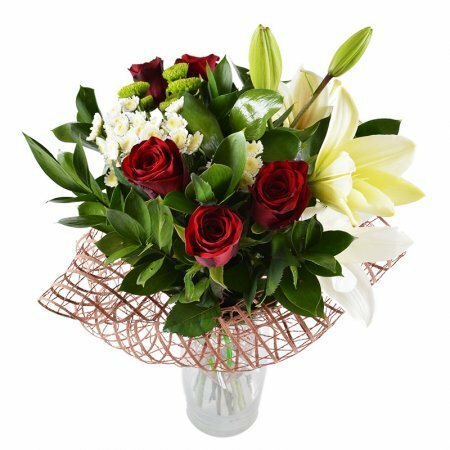 The vase is not included into the price. Спасибо большое за хороший сервис! Качество и свежесть цветов просто супер! Manager response: Спасибо за Ваш отзыв! Будем рады дальнейшему сотрудничеству!